EMERGENCY! ACTIVE AMBER ALERT! PLEASE SHARE IMMEDIATELY! Details from police: A child is still missing and an Amber Alert has been issued after a women stole a car from Save-A-Lot in north Springfield. Springfield Police Lt. Brian Phillips tells KOLR10 that a white female with blond hair jumped into the victims car and drove away. The 4-year-old was later dropped off by the suspect in the 800 block of S. Newton Avenue in West Springfield. 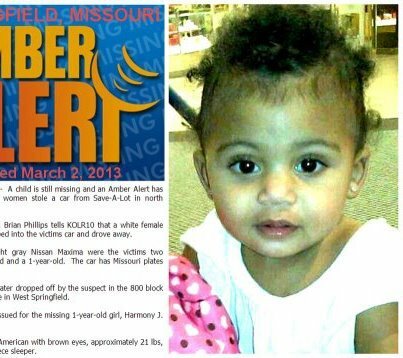 The Amber Alert is issued for the missing 1-year-old girl, Harmony J. Blue. Harmony is African-American with brown eyes, approximately 21 lbs, wearing blue one-piece sleeper.